So January has past us by, we’ve made our marmalade and now to use it… I feel the novelty of freshly made marmalade on toast wears off after two weeks of consistently eating it for breakfast. With lots of jars given away as gifts and many more to get through I decided to make some marmalade cakes. I use a mini sandwich tin from Lakeland, which makes perfectly formed little cakes. You could use a muffin tin, as long as you thoroughly line it. Line a 12 cup mini sandwich tin with greaseproof circles for the bottom and a bit of butter for the sides. If using a normal muffin tin I would line it more thoroughly. Cream the softened butter, sugar and vanilla together until light and fluffy. Crack the eggs into a jug and beat with a fork. Add a small amount off the egg and beat using a hand whisk. Make sure the mixture does not curdle. Keep slowly adding the egg until half of it has been used. Put half the flour into the mixture and mix in using the hand whisk. Then slowly add the rest of the egg, followed by the remaining flour. Fold in the tablespoon of marmalade. Spoon the mixture into the lined tin. Make sure not to overfill – just over half full is perfect. Bake in the over for 20 minutes or until they spring back when lightly touched and golden in colour. Whilst the cakes are in the oven make the butter icing. Sieve the icing sugar into the softened butter and vanilla then mix using a wooden spoon until stiff. Once the cakes are baked leave them to cool for 10 minutes, then turn them out. Once completely cooled cut the mini cakes in half down the middle widthways and fill with a teaspoon of butter cream and a little marmalade. Sandwich the cakes together then top with marmalade and a piece of orange rind. As seen in the picture. 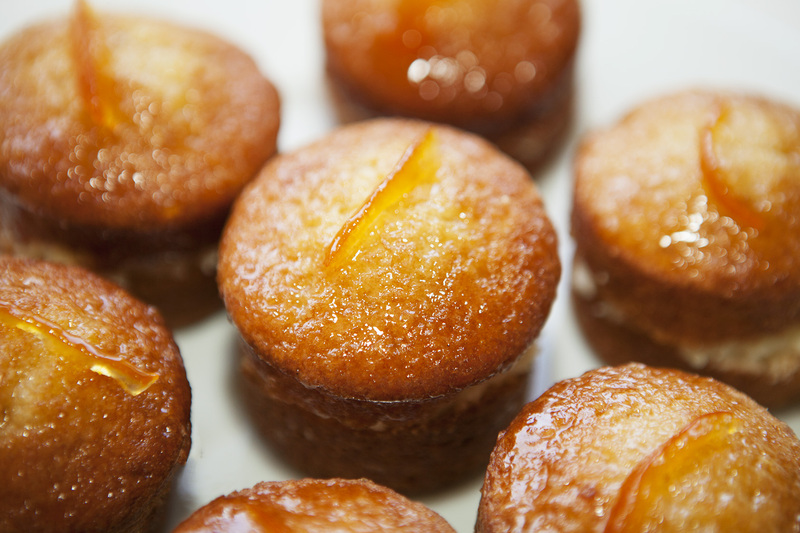 Tip: My marmalade has a quite runny consistency so is easy to top the cakes with. If yours is a bit stiffer, loosen it up my heating a little in a pan.